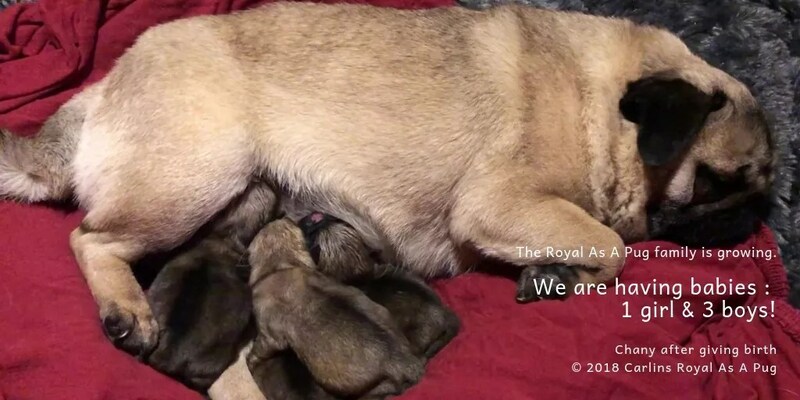 We Are Proud To Announce Our 2018 Litter Of Pug Pups! Our beloved Pug LINE CELEBRITIES COCO CHANEL « CHANY » gived birth to a stunning self whelped Pug Puppies Litter, sired by Ch TANGETOPPEN’S TAKE A HINT « TINO » Crufts 2016 1st Limit Dog, 7 Best in Shows, 9 CACIB, 8 CAC UK Champion Dutch Champion Res Best Male European Dog Show 2016 Breeder: Ms Elisabeth Juverud at KENNEL TANGETOPPEN – maybe the 1 Pug Kennel in the all World – Owner: our Friend Ms Julia Ashton at ZOBEAR Show Kennels. Puppies will be available for visits at the age of 5 weeks old, and will not be released to their new for ever loving homes until they are 10 weeks old. Videos and pictures are available on our FaceBook page and Website.